The Legend of Zelda: A Link to the Past was made by Nintendo for the Super Nintendo Entertainment System (SNES) and released in North America in 1992. It's an action/adventure game (though I always lump it into the RPG category) that uses a top-down perspective at an angle to simulate depth. I typically prefer the older titles in the series, and would go so far as to say that A Link to the Past is my favorite Zelda title -- narrowly eclipsing the Ocarina of Time/Majora's Mask duo for the Nintendo 64. You play as the protagonist Link as he journeys through puzzle-filled dungeons to rescue the descendants of the Seven Sages and retrieve the stolen Triforce to restore balance to the world. While you do technically rescue Princess Zelda during your adventure, it's right at the start of the game and isn't really a big part of the plot. One big part of the game is the fact that you have both a light world and a dark world and eventually you are able to travel back and forth between them. Changing something (like flooding a corridor) in one world also affects the other world (allowing you to swim along that corridor to an otherwise unreachable ladder), which adds another element to the already bountiful puzzle aspect. The world map is medium-sized, but there's an awful lot of content packed into it. Combine this with the dark world almost doubling the size of the adventure, and this game has quite a lot of gameplay and will require some time investment to complete. There are a lot of different enemies, from armored knights to big skeletons, snakes and slimes to cyclops and jellyfish, there's quite a diverse group of enemies to battle. These aren't just cosmetic differences either; one enemy may burrow up from underground while another may block your attacks with his shield. One may zip around the screen really fast while another might just sit and shoot fireballs. You can look at much of the world map area from the start, but many areas are inaccessible for a while. There may be a gap you can't cross until you obtain the grappling hook item, or a boulder you can't pass until you obtain the gloves to lift it with. While this does help to keep you pointed in the right direction as far as game progression, it does make the game a little more linear as well. The boss encounters in the various dungeons are equally as impressive and varied. Bosses usually take up like a quarter of the screen and are pretty mean looking, and they all fight very differently from each other. Usually they can sap quite a bit of your health very quickly, but they all have a pattern and/or weakness to exploit (often involving an item found in the dungeon) that makes the battle fun -- it's still challenging, but just the right amount. The puzzles are pretty much a staple of Zelda games, and while there are a few that are frustrating and may leave you Googling for a walkthrough, most are balanced rather well. Blow a hole in the cracked wall here, go through and grab a key, go back up and pull a lever to flood the corridor, swim to the end and push a block down a hole, push that block onto a switch on the floor below to open a door above, etc. Overall very fun though, and it just wouldn't be a Zelda game without them. There are lots of items to find as well and they all have their uses. Bombs, a bow and arrows, grappling hook, shovels, nets, mirrors... suffice it to say that you'll continue receiving new gameplay mechanics and puzzle-solving items throughout the game to keep things interesting. Some of the items you may remember from previous Zelda titles, but there are a lot of new ones as well -- the grappling hook in particular was a lot of fun. The game looks beautiful -- the colorful graphics are very polished and animations are smooth all around. You can tell that Nintendo had a nice budget to work with while developing the game and took their time to do it right. In my opinion A Link to the Past is one of the better looking games on the SNES, especially the enormous dungeon bosses with their high level of care and detail. The music is mostly outstanding as well. A few tracks like Zelda's Lullaby are so great that they became classics and Nintendo pulled them into the later Nintendo 64 title, Ocarina of Time, where they continued to be fan favorites to a new generation of Zelda players. 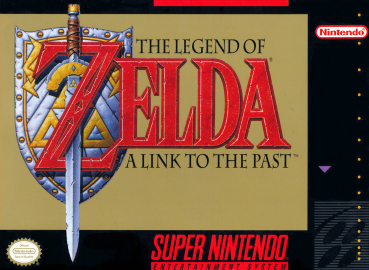 Tight controls, countless hours of gameplay, unique boss encounters, beautiful presentation and a good story make A Link to the Past one of the must-have titles for the SNES. Being one of the best selling games on the system means that there were many copies produced, so you can still find it around today for $5-$8, which is an absolute steal. In fact, I would almost go so far as to say it's worth the price of picking up a $30 SNES console on eBay for this title alone. I'm normally not a huge fan or sports games, though there are a few that I enjoy. I did enjoy the original Tecmo Bowl for the NES, so when I bought my used Sega Genesis and Tecmo Super Bowl III was among the games included with it I remember looking forward to playing it. As it turns out, it was a game I quite enjoyed quite a bit. 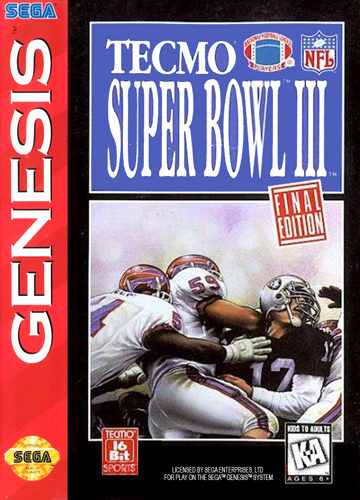 Tecmo Super Bowl III: "Final Edition" was developed and published by Tecmo in 1995 for the Sega Genesis as well as the Super Nintendo. While both versions are mostly the same, there are minor differences between them and this review will be focused on the Sega Genesis version. First off, the game featured real NFL teams and real NFL player names, and this is a huge thing in sports games. Taking control of some made up team with unknown players just doesn't give you the same satisfaction as controlling your favorite team and making big plays with a character you recognize. Most players even have small character portraits that pop up when you make a big play with them, sort of like a little newspaper headline. Tecmo Super Bowl III has a lot of features including a season mode where you can play through the 1995 NFL schedule, and if you continue further the game will generate new schedules to let you play as a franchise. You can trade players, draft free agents, suffer injuries, attempt 2-point conversions. The game tracks statistics for both players and teams, tracks league leaders, lets you change the lineup and roster around... it's an awesome amount of customizability compared to most earlier games, and in fact contains most of what you'd expect in a current generation game except for the graphics. One thing that I like and dislike both at the same time is the Super Star Editor. This allows you to create your own custom players with a limited amount of points to distribute amongst his various statistics (such as speed, power, passing speed, etc). These statistics continue to improve as the player does well in games, regardless of whether they are played by you or simulated. It's really nice, but the one thing I don't like about it is the fact that you can sometimes create perfect players who are maxxed out in every stat... and even then, sometimes you still have points left over! Perfect running backs, wide receivers, offensive linemen... I've never stumbled upon a perfect quarterback yet, but you can usually end up with one way better than any real player in the game. This really should have been limited to an extent, or at least made it extremely rare to get a perfect player. The gameplay is really good though. You have the option of selecting between two different play books during each play, and inside each one is a set of four rushing and four passing plays giving you a total of eight of each. Runs are smooth, passes are quick and easy by cycling through receivers with the A button and then throwing the ball with the B button. Controls in general are easy, in fact you mostly just use two of the three buttons on the Genesis controller. One negative point to mention is that often as your receivers run down field, you're left with looking at their icons at the edge of the screen while the player is out of sight, which makes it really difficult to see who may or may not be covered. This makes it difficult to complete passes sometimes, and is really my only qualm with the actual gameplay mechanics. Visually the game isn't bad, but it's not really good either. Tecmo Super Bowl 3 is 2D and presented with one team on each side of the screen, but tilted slightly so there's a sense of depth at least. It works well enough, the problem is just that everything is noisy and grainy, characters are blocky, animations are simple, colors are drab. Don't pick this up for its visual appeal! Sound fares a little better, with the low buzz of the crowd noise in the background that actually raises and lowers in volume at key points. Things such as touchdowns and fumbles are announced by an announcer, though the voice is kind of gravelly and raspy. Overall not bad though. Being a sports game, replayability is high as you can play through season after season improving your team, trading and drafting players, and improving your custom players. In addition, a quick preseason game against a friend is always fun and I find myself breaking out the game more often for that than I do to play through seasons. It's a decent game with fun gameplay at the core and simple, intuitive controls that make playing easy. However, it loses a star because the presentation leaves a lot to be desired and another star because of the issue with receiver visibility. Three out of five, but still slightly above average worth of picking up, especially since it can be found for just a few dollars online. Despite the flaws it really is a fun game, and it's probably the best football game available on the Genesis anyway. When I have my Genesis hooked up to play Shining Force or Shadowrun or something, I often plug in Tecmo Super Bowl III a few times to play in between. Note that this review is on an ALPHA version of Gnomoria (specifically version 0.8.24); this version is not the final retail version that will eventually be available. It may be some time before the final version is released, and this review should help you decide whether or not the game is something you might be interested in and whether or not to pre-order it for the pre-release discount price. So far the gameplay in Gnomoria pretty much screams "I'm a graphical Dwarf Fortress clone", and that's not a bad thing. I've always loved Dwarf Fortress, but the ASCII graphics leave much to be desired and likely turn a lot of people away before they even try it. I can best describe Gnomoria as a strategic simulation game, where you control a group of gnomes as they try to make a life for themselves in the wilderness. The world is randomly generated based on a seed, and there are a number of options you can play with that effect things like the depth of ores you can mine, the size and flatness of the world, enemy strength, etc. It takes a minute to generate, so I usually start the game and go grab a drink or have a cigarette while waiting. It only takes a minute the first time for the initial generation though, and any subsequent times you play on the same map load quickly. While the graphics are a vast improvement over the ASCII text in Dwarf Fortress, they are still pretty simple. They are fairly small, isometric sprites and there's not much in the way of animation, but they are kind of cute and the style is neat. There's a good amount of variety to the world, with different types of trees and plants, rocks and minerals, as well as randomly generated caves and water sources throughout the map. You can build up and/or dig down, but one of the most important things to do is section yourself off from the main world to afford yourself some sort of protection against enemies. A game year is divided into four seasons of 12 days each, and during the first season you don't get any real enemies so that you have some time to prepare. You'll still have the occasional wild animal like a bear or a honey badger, and these can do some damage to your fresh little gnomes, but the main enemies aren't around just yet. You can mine, dig, forage or deconstruct just about everything in the game, and this leaves you with materials you can use to build new things. A lot of people start the game by digging into the side of a hill and forming their main "base" or whatever in the tunnels, and that's a good strategy. I, however, prefer to choose a flat area of the map to start with (or flatten a hill if necessary) and build dirt walls around a big starting area and go from there; I just really like having the extra light during the day time. You start out with 9 gnomes, and while you can't directly control these little guys, you can assign tasks that you wish to be done and they will work through them. You can, for example, designate an area of trees to be felled and any woodcutting gnomes will start chopping them down. You can designate a tunnel to be dug, and any miners will work at digging it out. You can farm, plant groves of trees, raise Yaks/Emus/Alpacas, and any number of various things that keep the game interesting. You may have 2 woodcutters and have them designated to cut down a pile of trees, craft the logs into planks, carve some wooden trinkets, make some beds and some doors, and have them so overwhelemed that certain things you really need to get finished aren't getting worked on fast enough. Thankfully though there is a priority system for most things that you can raise and lower at will, and this helps a great deal when it comes to making your gnomes do what you want them to do in relatively the right order. Gnomes have needs like The Sims; they get hungry, thirsty and tired. You can get food from butchering animals, farming wheat for bread, picking wild apples and strawberries, and even making sandwiches from bread and sausage. Drinks are similar -- Yaks produce milk, a well can get water, wheat can be turned into beer, berries can be turned into wine, etc. Usually the easier to acquire food and drinks don't satisfy the gnomes for as long as the ones that take longer, so there's good reason to work your way towards making better things. A gnome will drop what he's doing and go grab food if he's hungry or drink if he's thirsty, so having items that keep them happy longer means they'll spend more time working. Gnomes have a variety of skills, from mining to carpentry, horticulture to hauling, woodcutting to caretaking. The gnomes you start out with all have pretty good skills in certain areas and are assigned to those tasks by default, which ensures you have a couple of good woodcutters, miners and farmers, a builder and a rancher. You also start out with three Yaks and a few containers containing some initial food and drink, a few tools, a sword and a couple pieces of armor. Most of the buildings you can build are 9 square blocks and are called "workshops". These take various quantities of wood, stone and/or metal to construct and allow you to build new items when completed. A carpenter allows you to make things like chairs, tables, doors, beds and crates. A blacksmith allows you to make tools, a furnace allows you to turn wooden logs into coal, etc. Kitchens allow you to butcher corpses (animals as well as enemies like goblins -- anyone for an ogre sausage?) while the distillery allows you to make wine and beer. You can even make complex mechanics using windmills, steam engines, pressure plates, axles, gears and switches. Enemy traps made of hatches or mechanical doors are always fun! The combat system is probably my favorite part of the game, as it's surprisingly in-depth! If a gnome gets his leg chopped off, he moves slower. His arm gets chopped off? He drops his weapon because he can no longer hold onto it. Armor can be broken off of the body, eyes can be gouged out so that you can't see anymore, bleeding to death is not uncommon. A few times I've seen a gnome stab an enemy in the chest, penetrating it's lungs, and causing it to actually suffocate and die right there. Crazy. Like I mentioned before, the graphics are pretty simple but neat. You have many, many layers of depth so you can mine way down into the ground, and you can similarly build up quite a ways. Occasionally you'll get annoyed because you're working 3 layers above ground, but you'll be trying to build something at ground level and not realize you're still on layer 3 though. It takes some getting used to for sure, but it's not too bad. Things are fairly well detailed though. For example, your gnomes all look completely different from one another. They have various haircuts, beards, etc... sometimes they'll even have a top hat or a monocle. You can see what they have equipped and in their hands as well; a gnome with copper armor and a mining pick can be easily distinguished on the map and not confused for a gnome wearing bronze armor and wielding an iron claymore. Sound effects are mostly non-existent, but the background music is pretty good despite lacking much variety. It's fairly mellow and non-intrusive, but it's a definite improvement to the game rather than a detriment. I especially like the foreboding music that plays when an enemy appears on the map. The interface could use a little improvement as well, but at least you're give two options to do things. First, there's a popup menu full of submenus full of submenus when you right click on the screen. This is a typical cascading menu like the Windows Start Menu and is fairly easy to use. Secondly there's a hotbar at the bottom of the screen, and clicking a button pops up a sub-hotbar, etc. This is also fairly easy to use, but seems a little less intuitive somehow. Both menus feature the same problem though -- they just don't seem to be sorted well. Things seem to be in weird places and really take some getting used to, but even then I still occasionally get confused looking for something. For example, building a dirt wall is in a different section of the menu than removing a dirt wall. Removing dirt stairs is different than removing a dirt wall. Kind of quirky, but remember this is an alpha version so it will probably get cleaned up and polished long before the final version is released. Another thing to note is that while the world is built of layers, there are actually "wall" pieces with thin "floor" pieces on top of them in each layer. I'll often get confused as to why my gnome is stuck somewhere, only to realize that he removed the floor tiles and trapped himself. There are still wall tiles all around on the layer under him, but the floor tiles are gone from the top so he can't walk across them. Easily remedied by building new floor tiles, but it happens quite often. The artificial intelligence of the gnomes also has a lot to do with this, as designating a big chunk of floor for them to remove will often result in them trapping themselves instead of removing it in a logical manner that would allow them to leave afterward. Everything in the game has a base value, and totaling it up gives you your "Kingdom Worth". At the beginning of every season you get "Gnomads" who migrate to your kingdom and increase your gnome population, and how many of these Gnomads you get directly relates to your kingdom worth. More and stronger enemies also appear as your kingdom worth goes up, so it keeps the challenge going for a while. The end game isn't fleshed out too well yet though, as you get to a point after a number of years where your soldiers can pretty much annihilate anything that comes your way and the challenge goes away. It's still fun at this point, but I usually just start a new game instead. There is so much more I could say about this game, but your best bet is just to try it for yourself. You can download a free demo of the game from Gnomoria.com and play for 6 game days. It's about 100MB in size, so it's a quick download for anyone short of dial-up users. If you decide to purchase the game after, you can continue playing right where you left off, which I think is always a good feature. All the programming and design for Gnomoria is surprisingly done by one single guy, and he's pretty active on the official forums (username: RoboB0b) answering questions and talking about his plans for the future of the game. He also manages to get substantial patches out to the game regularly, the frequency of which amazes me a little. If you like Dwarf Fortress, Towns, Minecraft, or simulation games in general then you should definitely give Gnomoria a try. System requirements are pretty modest, needing Windows Xp/Vista/7, a 2GHz processor, 1GB of RAM, 50MB of hard drive space, 128MB of video memory and DirectX 9.0c or higher.